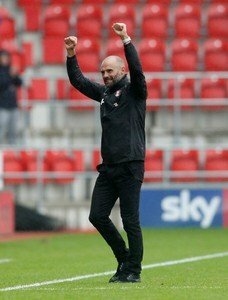 Rotherham United Manager Paul Warne thought his team were ‘excellent’ despite losing two men to early showers and losing to Bristol City one-nil. ‘We created some good chances in the first half and I thought our game plan was really good,’ the Millers Boss told Freeview iFOLLOW after the defeat saying when it was eleven v eleven the Millers were the better team. I’m not going to say the Millers didn’t do well and it’s quite obvious that two red cards is going to change it. Yes, we had chances – or that should maybe be, again we had chances because I do think that Rotherham United have spurned more than double the chances we’ve actually scored. I said at the beginning of the season we have to take those chances yet still we miss. I do wonder what we practice in training? It’s great being fit, it’s great being able to set those chances up but it’s now got to the point where we need to be getting goals. Whether that means starting again and teaching players how to score or getting in another striker who can score I don’t know.